*HOT* Cricut Easy Press 2 Only $99 Shipped (normally $159.99)! Hurry and head over to Cricut to score an Easy Press 2 for only $99.00 (normally $159.99). Use the promo code APRSHIP to score FREE shipping. Head on over to Amazon where you can score this Multi-functional Assembled 3 Tiers 6 Compartments Storage Shelf for only $17.99 Shipped (reg. $89.95). The 80% off promo code: 80WS61BV will be automatically applied at checkout. Here’s the list of stores that will be closed on Easter Sunday. *HOT* Save $125 on a Nectar Mattress and Score 2 FREE Pillows! Check out this HOT deal on a Nectar Mattress. You can save $125.00 and score 2 FREE pillows when you use the promo code SHOP125 at checkout. That brings the price down to $699.00 shipped for one of the most comfortable queen sizes mattresses on the market! Have you checked out their warranty? It’s good for the entire time you own your mattress. Their guarantee is amazing. You can try Nectar mattresses risk-free for a full year. If you are not 100% happy, they’ll pick up the mattress for FREE and give you a full refund! Head over here to check out Nectar Mattresses, save $125.00 and score 2 FREE pillows! 2019 Tax Day FREEBIES and Deals! Tax day is almost here! Here’s the list of businesses that will help you save a few bucks on April 15th, 2019. Bananas Smoothies & Frozen Yogurt: Score a FREE small frozen yogurt on Monday, April 15. BJ’s Restaurant: Score half off a large Deep Dish or Tavern-Cut Pizza on April 15th. Boston Market: Score a Half Chicken individual meal with two sides, cornbread and a drink for only $10.40 when you use this coupon through April 15th. Bruegger’s Bagels: Score a Big Bagel Bundle (any 13 bagels and two tubs of cream cheese) for only $10.40. California Tortilla: Score FREE chips and queso with any purchase when you come in and say “1040” when placing your order. 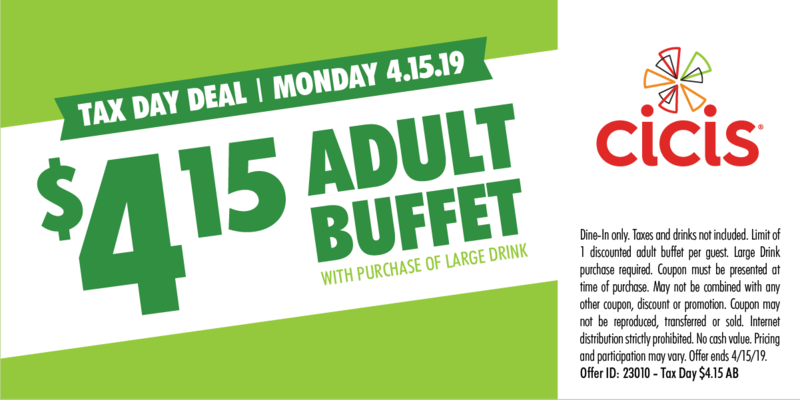 Cici’s Pizza: Score a large drink and an adult buffet meal for only $4.15 when you use this coupon. Corner Bakery Cafe: Between April 15th and 17th, score 2 entrées for only $10.40. 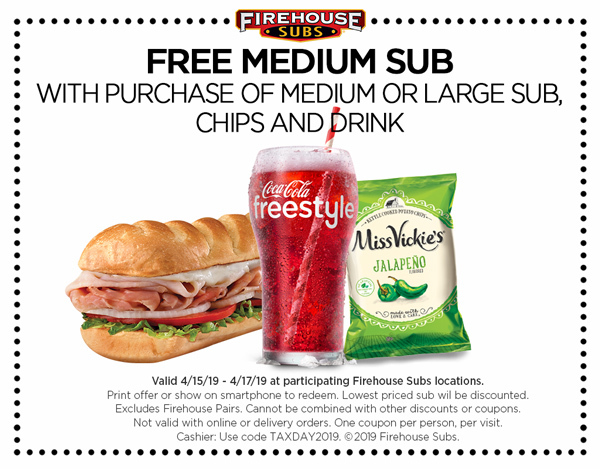 Firehouse Subs: Use this coupon to score a FREE medium sub when you buy one medium sub and a drink (valid April 15th -17th). Great American Cookies: Score a FREE Original Chocolate Chip Cookie on Monday, April 15th. Hardees: Score a FREE Sausage Biscuit on Monday, April 15th, between 7 a.m. to 10 a.m. Hot Dog On A Stick: Score a FREE Original Turkey or Veggie Dog on Monday, April 15th. Kona Ice: Score a FREE Kona Ice on Monday, April 15th. Office Depot: FREE document shredding (up to 5 lbs.) through April 27th when you use this this coupon. Potbelly Sandwich Shop: Mention that it’s Tax Day on April 15th to score Buy One, Get One Free Entrees. Schlotzsky’s: Score an Original Sandwich for FREE when you purchase a medium drink and chips on April 15th. Smoothie King: Score $2.00 off any 20-ounce smoothie between April 15th-18th. You’ll need to download the Smoothie King’s Healthy Rewards app to get this offer. Staples: FREE document shredding (up to 1 lb.) through April 21st. 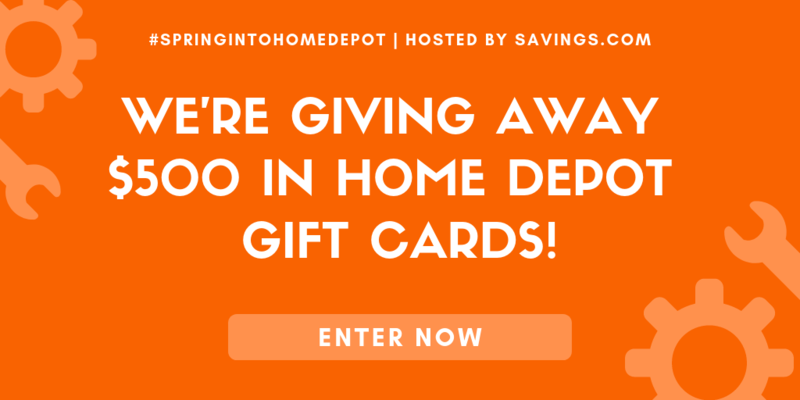 Win a $50 Home Depot Gift Card (10 winners)! Through Wednesday, April 17th at 11:59 PM PT, head over here to enter for the chance to win a $50.00 Home Depot gift card. There will be 10 winners! The winners will be chosen through a lottery drawing and notified on Thursday (4/18) via the email address they used to enter. Good luck! Make sure you check out some of the great deals going on right now at The Home Depot! *HOT* National Consumer Panel is Looking for More Members (earn great rewards)! National Consumer Panel is looking for more households to join their program again! Click on the above picture to apply. You can earn some really great rewards! The National Consumer Panel has opened up again and is now taking NEW applications! You may be approved based on your zip code. The National Consumer Panel is a “mini-U.S.A.”, representing millions of Americans. By scanning the bar codes on your purchases and completing fun surveys, you can make your opinions count in the consumer marketplace. They will send you a scanner to scan your products and in turn you received valuable gift points that are redeemable for electronics, household items, jewelry, toys and lots more! They may not have a spot available in your zip code now, but one could open up at anytime- check to see if you can get on their waiting list- this is a hugely popular panel to join. Good Luck! Once per week the scanner sends the data automatically through my cable Internet connection. I do not have to do anything. I also fill out online surveys through their website and receive bonus points for completing the surveys. If I scan every week (and I have) I receive bonus points at the end of the month. There are also opportunities to win money – not happened to me yet – but there are weekly winners. If you have ever thought about applying to do this, I really encourage you to do so. It doesn’t cost you anything except a bit of time. I hear that younger children really enjoy helping scan the items. Score One Month of Coffee for Only $5 at Burger King! If you buy coffee out every day, you’ll want to check out this deal from Burger King. When you sign up for their BK Cafe Coffee Subscription for $5.00 a month you’ll score a FREE Small Hot Coffee every day at any participating Burger King. Look in the offers tab of their app to find the subscription. 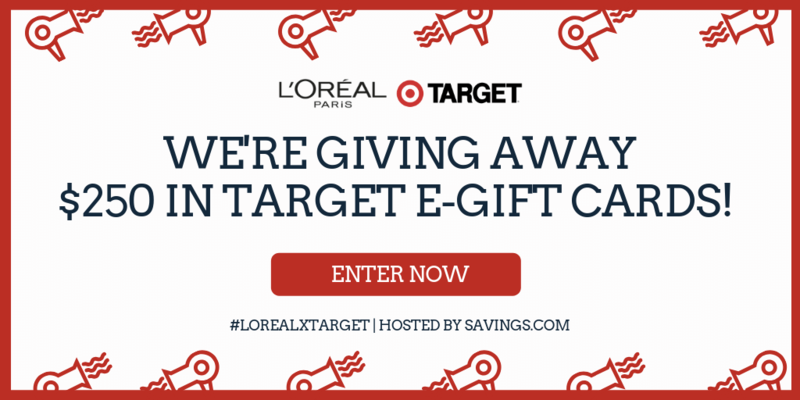 Win a $50 Target Gift Card – 5 Winners! Friday, April 5th at 11:59 PM ET, head over here to enter for the chance to win a $50.00 Target gift card. There will be 5 lucky winners. The winners will be chosen through a lottery drawing and notified on Monday (4/8) via the email address they used to enter. Good luck!